Are you using a Bootstrap powered theme for your wordpress website? And looking for some good responsive wordpress plugins to power up your site? Here we have listed the best wordpress plugins for your bootstrap wordpress theme. Some of the wordpress plugins listed over here are bootstrap based and some are non-bootstrap but fully responsive. Bootstrap shortcodes for wordpress let you add bootstrap components in your posts and pages with simple shortcodes. You can add container, row, button, panel, well, collapsing content (accordion), carousel, modal and many other bootstrap components with this wordpress plugin. Check out Bootstrap shortcodes for wordpress now. This wordpress plugin let you add Font Awesome icons in your wordpress posts and pages and custom post types with shortcodes. A button will be added above your WYSIWYG editor that let you add font awesome icon in no time. Want to get more subscribers for your website? Elegant subscription popup plugin helps to do it. Elegant Subscription Popup is a responsive plugin that shows the feedburner form with cool animation effect. The plugin doesn’t bother the visitor to subscribe repeatedly but only shows the feedburner subscription form with interval set by the admin. Looking to add a feedburner subscription box in the widget on your sidebar? Feedburner Email Subscription is bootstrap based wordpress plugin that let you add a cool feedburner subscription box widget. 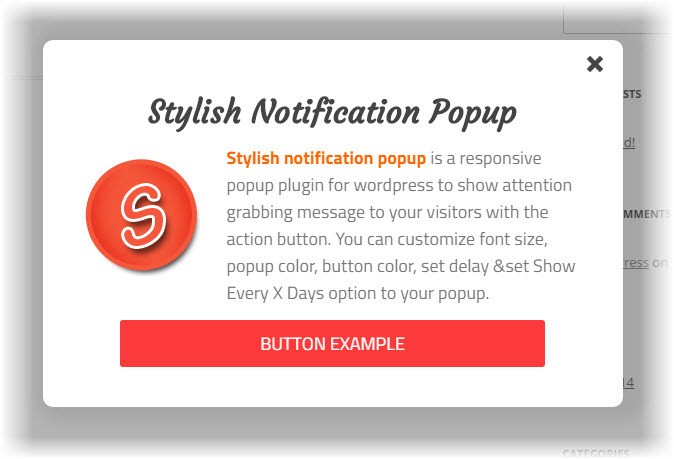 Stylish notification popup is a responsive plugin for wordpress that makes it easy to show attention grabbing message to your website visitors with the call to action button. You have crafting very useful article. I know some bloggers who are using Bootstrap Based WordPress Theme. I will refer your article to them. Hope in future more useful content will be found from your blog. Hi! Thanks for interesting information! Slider can make your website more attractive. So, I want to add Avartan Slider in your list which is also a useful plugin with bootstrap based WordPress theme. It comes with easy user interface and third party video integration like Youtube, Vimeo video with image preview. It is responsive plugin to create stunning image slider and video slider for your WordPress website. This is really nice slider plugin to overcome issue of your nice presentation of your home page.